Pure Quartz are leading UK dealers and experts in quartz design and its provision within the home. From quartz bathroom installations to quartz kitchen worktops, we have a range of different varieties in terms of high quality stones and finishings to share with you. 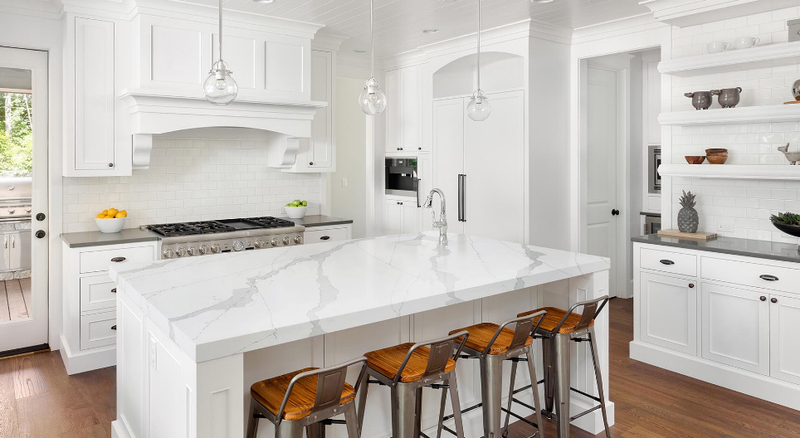 We offer reliable prices on all types and provisions of quartz, meaning that the cost of your home design project – based upon our leading prices – will only ever be delivered to you once we have completed all installations to your total satisfaction. Throughout Bromley, Lambeth and South East London, we are trusted as top specialists in quartz worktops – we have more colours and types than any other company or supplier our size – meaning that quality and variety are always guaranteed no matter whether you opt for office countertops, a full quartz office or otherwise. With Quartz Care, too, we’ll make sure that you get access to our expert advice and aftercare so that you can continue enjoying your luxury stone worktops and kitchen top installations for years to come. Our designers work just as hard as our fitters to make sure that you get the best possible look for the rooms in your home. For bathrooms, office spaces, wet rooms, kitchens and even flooring, we have an immense and immaculate range of quartz worktops, countertops and custom options to dazzle and delight. We work in a whole spectrum of colors as well as divine black, white and grey, bringing a luxury new touch to your office worktops, kitchen countertops and more besides. From designs through to installations, we will handle every aspect of your new luxury house refurbishment – or as much as you’d like us to! As experts in quartz and stone for home refurbishment. We of course partner with a series of well-known brands and offer a huge variety of different choices for everything from bathroom countertops to budget kitchen worktops – all at a remarkable low cost. Partnering with the likes of Samsung, Arenastone, Compac and more besides, we are proud to be able to design and install surfaces with Cimstone, Silestone Quartz, Cambria Quartz, Classic Quartz, Istone, Lunastone, Unistone, Santmargerita and in Opal, too. From Silestone worktop installations to Lunastone bathroom flooring, we will find the best look and ideas for your brand new home. If you are interested in bringing the magic of affordable quartz worktops templating into your home, call Pure Quartz today for no obligation quote. For local advice and for innovative & Unique Design choices, as well as stunning finishing and aftercare, you need never look elsewhere. Call us today on 01233 733111 or email us for more details at your convenience – and let us know how we can help!